Periodontal surgery is a plastic (reshaping) surgical procedure designed to restore and regenerate normal form and function to lost and damaged periodontal structures which support the teeth (the gum tissue, periodontal ligament and bone). This article is an overview of what a candidate for periodontal surgery can expect and a primer for further information and discussion. 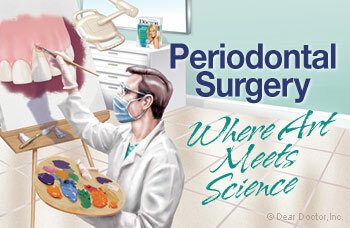 It follows an article entitled Understanding Gum (Periodontal) Disease in a previous issue of Dear Doctor magazine. An understanding of what periodontal surgery is designed to do, what makes it successful and what sustains the results over time is critical to successful treatment of periodontal disease. Periodontal surgery is not a cure, but rather an adjunct to making long-term treatment outcomes more favorable. Unlike surgery to take out an inflamed appendix, which removes the disease with it, the potential for the recurrence of periodontal disease still remains in susceptible individuals. The long-term goal of periodontal surgery is to increase the life expectancy of the teeth. Over a lifetime, the treatment for periodontal disease is primarily aimed at controlling its cause, microbial dental plaque. The purpose of periodontal surgery therefore is to treat deformities and tissue loss created by the disease process. This is accomplished by eliminating “pockets” of diseased tissue; regenerating and reconstructing gum and periodontal tissue attachment to the teeth and generally to provide an environment more conducive to daily oral hygiene and professional maintenance care. The end results of periodontal disease include loss of the tight attachment of the gum and periodontal tissues to the teeth. Just as one can put a hand in a pocket, a space by the side of clothing, pockets can also form around the teeth, into which fine probing instruments can be inserted to measure the degree of vertical tissue detachment [see illustration above]. This detachment, results from chronic inflammation as described above. Breakdown ultimately causes bone and periodontal tissue destruction giving rise to different patterns and shapes of bony defects which surgical treatment aims to regenerate and repair. For the most part the detached gum tissues either recede or remain as a detached curtain around the teeth. Periodontal disease is detected when your dentist physically and visually evaluates the gingival (gum) tissues, probes to determine whether the attachment levels to the teeth are normal or abnormal, and evaluates bone changes through dental radiographs (x-rays). Depending on these findings, along with your general health status and health history, your dentist may also refer you to a periodontist, a dentist specializing in the diagnosis and treatment of periodontal diseases. The diagnosis of the specific type of periodontal disease that may require surgical treatment is important, because it will have a direct bearing on the techniques used and long-term outcome of treatment. Diagnosis may also include risk assessment, to aid in determining long term outcomes, known as prognosis. Both personal and professional assessments of individual risk are available (American Academy of Periodontology www.perio.org). Behavior Change: Consistent behavior change is the most important element in maintaining long-term periodontal health, since daily plaque removal in large part will set the stage for sustained, successful surgical treatment. For many people this involves forming new oral hygiene habits, along with cessation of smoking and other lifestyle changes. Calculus (Tartar) Removal: Your dentist will also see that your teeth receive a thorough cleaning to remove the deposits of calcified plaque called calculus or tartar and other bacterial toxins which become ingrained into the root surfaces. This process of mechanical cleaning is generally known as scaling and root planing, using hand scaling, ultrasonic or laser instruments and will sometimes require local anesthesia. Occlusal Bite Therapy: Generally, attention to the bite or bite disorders are treated during or after initial therapy once an inflammation free environment has been established. It is important to stabilize loose teeth prior to surgery, because this in itself encourages healing of the periodontal structures and bone.